Gamakatsu are proud to present a hook purpose-built for hard-core game fishing. This handsome forged steel hook is super heavy-duty, and designed to handle big game fish species. The sleek blade tapers into a knife point edge and will penetrate with absolute surgical precision, and will find home for a solid hook up. 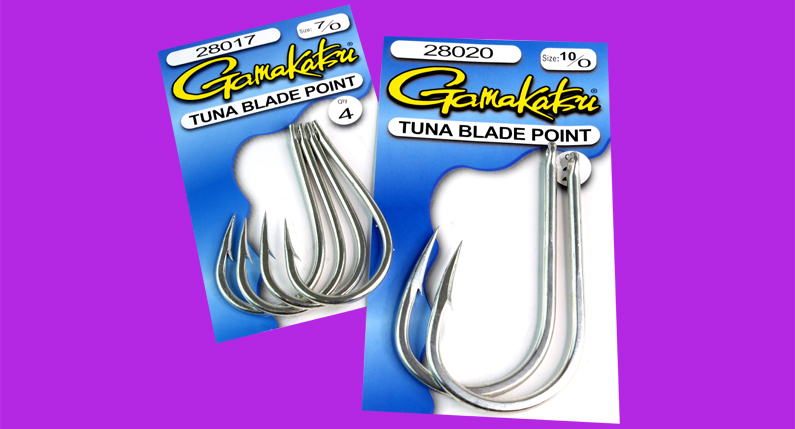 Gama’s new Tuna Blade Point fits into trolling skirts, can be stitched into baits and is also an excellent stiff rig hook, making this an extremely versatile bit of kit. It’s the ideal tool whether you are fishing for records or are a weekend game angler. This great hook comes in sizes from 7/0 to 10/0, and is razor sharp out of the packet. Make sure you’ve got some packets of these next time you’re planning to hit the big blue in search of big angry game fish!